Barska is one of the top most brand in the market that features on the scene when scouting for security solutions of various types. Barska has its corporate offices, warehouse and distribution in Pomona, CA (Southern California), and also has a presence in sport optics. The company offers an extensive line of precision sport optics products that include binoculars, riflescopes and spotting scopes to telescopes. Barska consist of multiple options to store the gun safes The company provides affordable gun safe for the kind of features. Barska is known to keep its users requirements in mind and its various feature rich models are a testimony to this fact. Depending on the model, anywhere from 30 to 120 individual identities can be programmed into a Barska biometric safe. Your storage solutions options are not comprehensive if you haven’t considered Barska. A relatively young company established in 1994, Barska makes up for it with its innovative technology. Barska biometric gun safes provide the very latest in technology to protect your firearms and your family. Its products are easily available all over the US. As far as Gun safes are concerned, Barska deals in Vaults, Biometric safes, Depositories, Cash safe box, Diversion boxes etc. So if you are looking for a security solution to store your valuables, Barska Gun safes are one of the best. A very safe and easy to access biometric fingerprint safe, the Barska biometric safe is a great addition to keep in places where you spend most of your daily time. The safe has a built in memory system that will allow you to store up to 30 different fingerprints and the size is big enough to fit in even the largest of handguns available. Overall this safe is excellent for storing your valuable and jewelry. The safe also comes quite handy for storing smaller firearms, but the bigger rifles will not fit. The safe has been proven to withstand high temperatures and keep documents dry if water is spilled or thrown on the safe. The mounting hardware of this safe has also been tried and tested on various walls and panels. The results found that the Barska biometric safe will not be pulled from the wall in any scenario and that you would need at least a few hours to dismount the safe without the right tools. The portability and lightweight materials used in the safe are ideal for mounting the safe on a higher and more secure panel. This will allow you to keep the safe away from the children and in perfect reach for you to access. The safe comes complete with mounting hardware and two extra keys that can be used if the fingerprint system fails. The fingerprint system can be accessed from any angle, giving you more functionality when mounting the safe. The two steal deadlock bolts keep the safe tightly secured and you won’t have to worry about anyone getting inside. 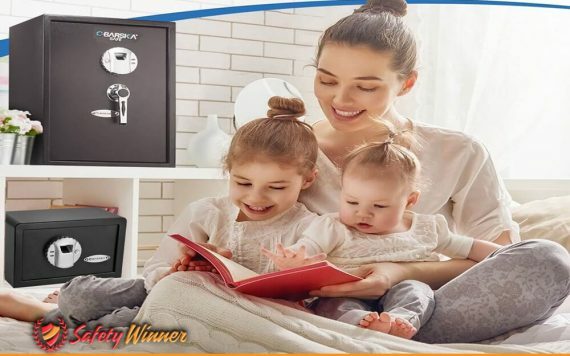 The biometric features of this safe is powered by using four AA batteries and with the little amount of power that is consumed by the scanner, these batteries can last for up to 2 years. This will save you a lot of money while providing instant and easy access to your firearm and other valuable items. The maintenance on this safe is not a lot and a thorough clean once a year may be all that is needed. The fingerprint scanner should also be checked every six months if you do not use the safe a lot to make sure that all the registered fingerprints are working. Finally, this safe can even be bolted to an RV or truck, but we highly do not recommend this. The safe proves to be very easy move from place to place and with the affordable price, this safe is sure to be a one-time buy and the perfect fitting for any gun enthusiast. 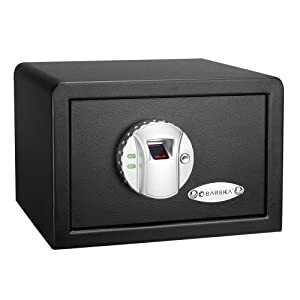 This is one of the best portable safes on the market and it features a unique opening ability. The safe can be seen as a box that is portable and easy to place or mount in most vehicles or anywhere inside your home. The safe is quite large on the inside and fitting your valuables with a firearm should not be any problem. The interior has been fully carpeted to add another layer of protection to your safe and be more resistant to impact. This will ensure that you are able to store all your breakable valuable inside and never stress about them breaking. The safe has been constructed from patented and high-quality materials that the Barska Company has always been known for. Aside from keeping the safe in your vehicle, you will also notice that the safe perfectly fits into most drawers and has the capacity to keep a lot of documents; thus you will be able to use the safe as an office safe as well. 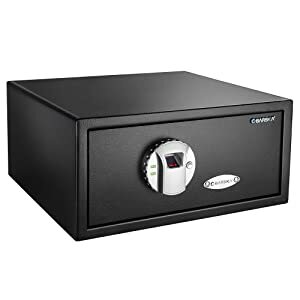 Furthermore, the safe has been made to be pry-resistant with the hinges being turned to the inside and ensuring that no weaknesses are present on the door. AT the back, you will also find pre-drilled holes that will allow you to quickly and efficiently mount the safe with basic household tools. The safe features a biometric fingerprint scanner that will allow you to store up to 30 fingerprints. We recommend testing all of these fingerprints every six months to ensure that they all are still fully functional and that you will always have quick access to the safe. Should the batteries die, you will receive override keys that can be used as backups to get in the safe. The safe locks using a motorized deadbolt. This bolt expands when it comes close to heat to ensure that the method of fire cannot be used without destroying the entire safe and all of its contents. With the package, you will also receive the four AA batteries that are used to [power all of the electronic features. These batteries have the capability to last up to 2 years depending on the amount of usage and the system will notify you as soon as they start running flat. We highly recommend the safe for office and home use. The safe will also provide a lot of functionality to people that travel a lot and you will be able to mount the safe in the car easily. The smaller size should allow you to easily conceal the safe as well. Coming from a top quality designer in China, this gun safe should be the ultimate small and compact gun safe for your home or the office. The safe is very light and the interior has been carpeted to ensure that all of your items and valuables are kept safe from damage. The interior capacity of the safe may not be overwhelming, but you will still be able to fit an average size handgun inside with a few of you highly breakable valuables and the safe will perfectly do its job. The interior will also ensure that all of the items stay intact, should the safe ever take damage from impact. The safe features a basic, but sturdy exterior shell that has been constructed from extremely durable and high-quality materials to ensure that no one can enter the safe using common break in equipment. Furthermore, the steel construction has also been metal coated to ensure that the safe does not show any damage, while still exerting some level of style that allows you to freely display the safe or mount the safe on a wall. The safe features two extremely strong live action bolts to secure all of your valuables on the inside and all of this can be opened using either the fast biometric locking feature or 1 of the 2 backup keys that have been provided to override the biometric locking system. The biometric locking system can save up to 30 different fingerprints and the first fingerprint to be used is considered to be the admin user. The admin user will be able to add and remove any users that no longer need access to the safe, making this the perfect safe for office use. Aside from the additional override keys, you will also receive the four AA batteries that are required to power the safe. These batteries have an average lifetime of 2 years and the safe will notify you once the batteries run low or just before they die. We also recommend testing the fingerprints every 6 months to ensure that the safe still perfectly responds to them and also to keep a damp cloth on hand to wipe down the scanner after every use to ensure that it is child proof. We highly recommend the safe to people with a smaller firearm or a limited number of valuables that need to be protected. The multiple fingerprint access feature on the scanner will also make the safe ideal for office use. Locks have been used throughout mankind’s history to try to keep valuables out of the hands of criminals. Until fairly recently, the only locks available were combination locks or key locks. While these locks will work well, they do have several disadvantages: key locks can be picked, a good safecracker can figure out the combination simply by turning the dial, and the key or written-down combination can be found. Most people will also write down the combination for a digital keypad safe, once again raising the possibility that it will be located and used. Barska biometric safes, on the other hand, rely upon your fingerprint to open the safe – no one except those whose fingerprints have been programmed into the safe’s memory will be able to open the safe. Another advantage to a biometric safe is the rapidity with which it can be opened; rather than fumbling around with a combination, key, or keypad, a swipe of your finger will open the safe immediately. This will be especially important when home protection is required.